Also we are a full scale products distributor with a delivery base 2-3 days a week for all businesses, and can provide all products they might need. Located in west central rural Arcadia, Iowa. As a small wholesale distributor we can help you with a wide range of products while giving you the personal service you deserve in a way that saves you time and money. Our goal is to help you grow your business and satisfy your diners, customers and guests. 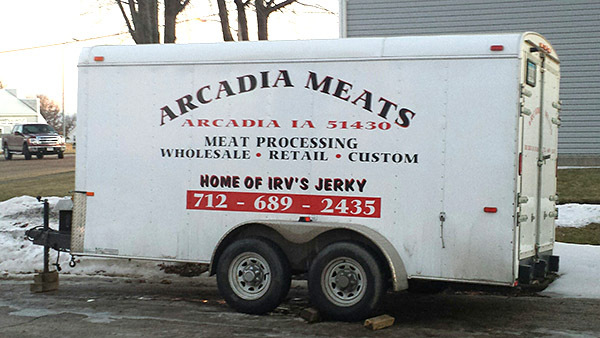 We currently have a distribution radius of approximately 90-120 miles from Arcadia. Look for our products in your local store. We also rent out our freezer / cooler trailers for use of events at minimal cost to you when product is purchased through us. Our mission is to provide you with the right product at the right price with the service you deserve. Over the years, our focus has been on helping all size of operators keep their costs low without sacrificing the quality of the products. We are extremely competitive on pricing without sacrificing service. Give us a call to see what we can do for you.